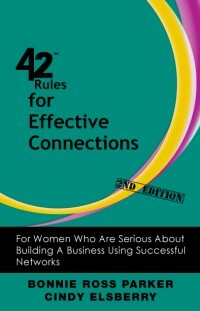 42 Rules for Effective Connections (2nd Edition) | Buy Career, Leadership, Sales, Marketing, Personal Growth books. Tired of the same ‘ole networking chatter? Do you think anyone is really listening to what you have to say? Wish you were somewhere else? If you have to network to grow your business and find yourself spending money going to events, meeting as many people as possible and returning to the office with a handful of business cards without the results you want, you can benefit from the strategies presented in “42 Rules for Effective Connections (2nd Edition)“ (also available in our career bundle). For anyone who wants to improve communication, get better results in any networking environment and alleviate the stress and anxiety that comes from building a business where you have to go out to meet potential customers – this career book is a must-read. The author provides a broad range of strategies that make the difference between networking that is ‘hit and miss’ versus networking that hits the bull’s eye. If you are serious about growing your business and simply are missing the mark on how to make your behavior stand out or if you are achieving success already and want to step up your game, this book will open the door to new possibilities. You can register for a free book excerpt on the right side of the page. Just complete the form and we’ll email it right to you. Registration with the BrightTALK network is free and gives you access to all 42Rules webcasts plus thousands more across their network.